After the results of your sleep study, the sentence was in: CPAP, every night, life sentence. And then you brought the thing home, hooked yourself up, and revved it up. Maybe it wasn’t instant for you, but a day, a week, a month later, it dawned on you: You’re going to pour distilled water into this thing’s gaping maw, and listen to that rumbling, sucking sound, for years to come. 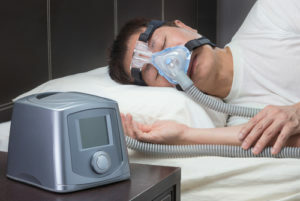 Do you absolutely hate your CPAP machine? Try this simple fix for sleep apnea! The CPAP is, of course, a safe, tried-and-true solution to sleep apnea. But frankly, it’s a one-size-fits-all solution. Another less intrusive solution is a mouth guard. Your dentist can fit you for a custom mouth guard that provides the correct adjustments to jaw and tongue position that many sleep apnea patients need to sleep safely and healthily. Related Read: How Can My Dentist Help My Sleep Apnea? See, dentists know a thing or two about this particular part of the human body. They’re not just waiting around to clean your teeth or pop in a filling! Are you tired of your noisy, uncomfortable CPAP machine? Are you looking for an alternative to ever getting one at all? Our experienced dental professionals can diagnose your issue, and fit you with a custom mouth guard to alleviate your sleep apnea. Give GPS Dental a call at (210) 633-3477.